Our best projects are usually the result of experimentation. We started with a lesson on shapes for the benefit of my preschooler and ended with a marvelous textured paint collage that even my second-grader calls “the best art ever” (until the next best art ever that is). It’s fun for kids of all ages to play with textures and make collages, combining these two into one project simply doubles the fun. My preschooler is learning all about shapes, so the other day I created a couple of pages of shapes and printed them out for all my kids to cut, color, and explore. After a while my older kids asked if they could color the shapes with the puffy paint. Puffy paint is what we call tempera paint mixed with glue and corn starch. It’s perfect for texture experimentation, so I threw in a couple of brushes, plastic forks, toothpicks… As we were looking at the pretty colored shapes, we thought, Hey, why don’t we put them in a collage. And we did! Disclaimer: For you convenience this post contains affiliate links. If you buy the products through my links, I will get a small commission at no cost to you. For more information, read my full privacy and disclosure policy. Print the shapes here or draw your own. Cut out all the shapes, except for the last page (this is the base of the collage). Mix puffy paint: tempera paint + liquid school glue + corn starch. You can play with different proportions. Play with the proportions until the desired thickness is achieved. It’s fun to make it a bit different for each color. Apply a small amount of paint to each shape. Experiment with creating different textures. Glue the shapes to the base: notebook page or the rectangle on the last page of our printout. Let it dry completely. Keep as is or frame it with washi tape. Do you like textured paint? What is your favorite collage idea? Hi! This Jae of Pinay Homeschooler. I love your work here, it’s like in Eric Carle’s books! I featured your post in our Learn & Play Link Up this week. Thank you for sharing and hope you join us again. Thank you! 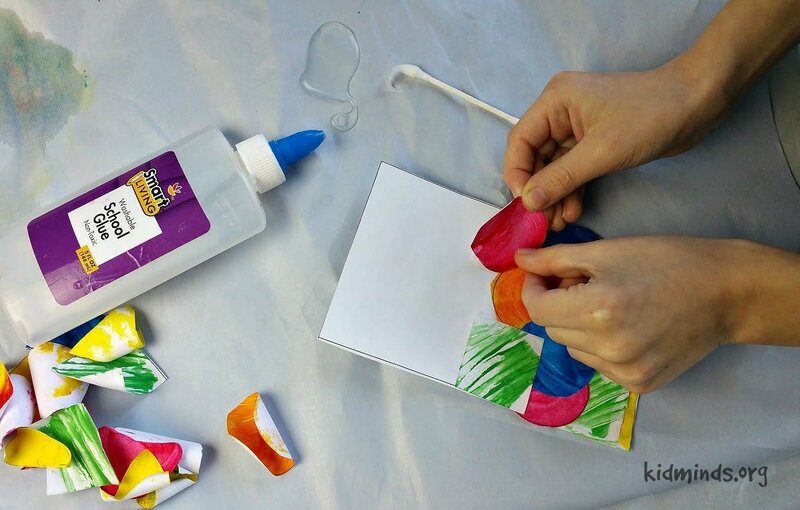 Hey Buddy!, I found this information for you: "Marvelous Textured Paint Collage: Shapes, Colors, and Fine Motor Practice". Here is the website link: https://kidminds.org/marvelous-textured-paint-collage-shapes-colors-and-fine-motor-practice/. Thank you.